What a photo! and the words fit perfectly. Wonderful pic and great haiku! The perspective in the photo is awesome! Growing up in Tucson, I have a deep connection and love for the desert. 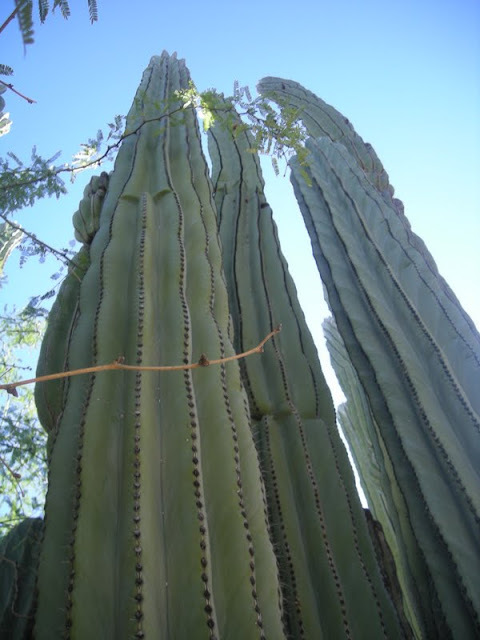 There's something magical about towering cacti, for sure! I LOVE your photo and your wonderful haiku! I'm back for another visit--even better the second time around! It looks as if a patient upholstery master spent eons hammering in decorative nailheads along each of those junctions. They do have a certain presence, looks like they are in a serious mood! Beautiful. We have so many of these cacti in our backyard. They grow so big and one day they sometimes topple. Excellent photo, great Haiku as well. It is a positively stunning image. The cactus is like a natural edifice, an organic tower. Beautiful and almost overwhelming in power. What an impressive photo. Wow! And just look at you - over here in new digs. Love the green. Pretty. Wow!! Breathtaking..so gorgeous..and beautiful words to match!